Psychiatric Pharmacy addresses the pharmaceutical care of patients with psychiatric-related illnesses and disorders. Currently there are over 1,100 BPS Board Certified Psychiatric Pharmacists. 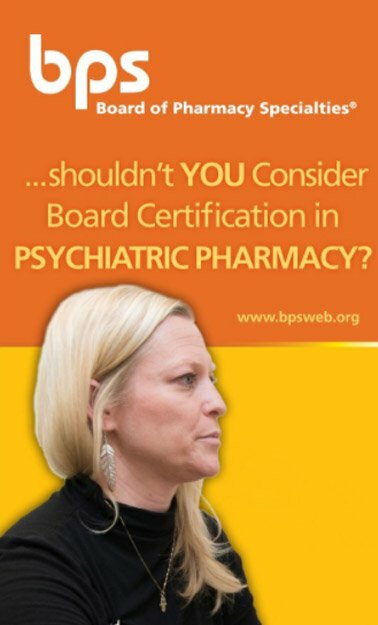 The BPS Board Certified Psychiatric Pharmacist (BCPP) program is a credential for pharmacists who have met the eligibility criteria below and who in their unique practice provide person-centered care that ensures the safe, appropriate, evidence-based, and cost-effective use of medications in the treatment of persons with mental illness. 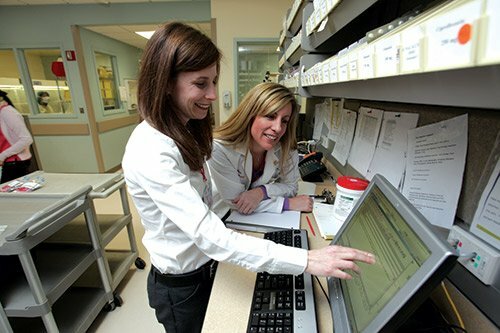 Designing, implementing, monitoring, and modifying treatment plans for patients. Educating patients, health care professionals, and other stakeholders. Providing leadership in the health system and public policy to improve the health of persons with mental illness. Achieving a passing score on the Psychiatric Pharmacy Specialty Certification Examination. Refer to the Psychiatric Pharmacy Content Outline for details. Earning 100 hours of continuing education credit** provided by a professional development program approved by BPS. The BPS-approved professional development program for Psychiatric Pharmacy is currently offered by the College of Psychiatric and Neurologic Pharmacists (CPNP). Please review the special note below. Contact CPNP for specific information about their program offerings that will qualify for BCPP recertification credit. A current, active license to practice pharmacy is required for recertification. BCPPs recertifying via continuing education are required to complete the Review Course a minimum of once during their 7-year recertification cycle. BCPPs recertifying via continuing education can use the Review Course a maximum of twice for recertification credit during their 7-year recertification cycle. The Review Course is revised and released every other year on the event year (2012, 2014…). Given this revision cycle, individuals cannot repeat the current edition of the Review Course for BCPP Recertification or ACPE credit. Board Certified Psychiatric Pharmacists® are also required to pay the BPS Annual Certification Maintenance fee of $125 each year for years one through six and a $400 recertification fee in year seven. Individuals with more than one BPS certification will only be assessed one BPS Annual Certification Maintenance Fee each year. Complete an ASHP-approved PGY2 residency in Psychiatric Pharmacy; and achieve a passing score on the BPS Psychiatric Pharmacy Certification Examination. Earning 100 hours of continuing education credit through the BPS-approved professional development program offered by the College of Psychiatric and Neurologic Pharmacists (CPNP).